Fast Fashion – Is there a quick fix? Confession time – I am a Primark addict. I’ve long been seduced by bargains galore in the shop – from little mermaid pyjamas and gym wear, to dresses, shirts, trousers and coats. Bed spreads for less than a tenner, a woolly pom-pom hat in every colour, I’ve impulsively purchased the lot. But is my addiction to quick fashion fixes damaging to the environment? What are the alternatives? I like to think that I carry out sustainable behaviours regularly. I have jumped on the no plastic train with my reusable coffee cup; perfected the ‘no I won’t be needing a straw’ line in bars; I travel sustainably wherever I can and I don’t eat meat. However, my taste for quick and easy fashion may be more impactful. Fast Fashion is the low cost high speed turn over of high street clothes designed to imitate catwalk trends – the idea is any fashion trend can quickly be replicated in time for someone to wear while its still en Vogue, quality isn’t top priority as its not designed to be worn all year round. On average, just one person in the UK will produce 70kg of textiles waste per year. That is a lot of clothing. Cheap, fast fashion means we are spending less yet buying more and the environment is paying the price. On top of this, the water and carbon footprint of new and existing clothing in each UK home equates to 100 pairs of jeans, over 1000 bathtubs of water and the emissions released from driving a car for 6000 miles. A bit more impactful than using a plastic straw I’d say! So I’ve tasked myself with investigating alternatives and seeing how easy it is to move away from the constant churn of cheap and cheerful. Select Carefully and avoid online shopping. Have you ever ordered more than one thing online with the idea to return what you don’t want? You might think differently upon hearing that 84% of returned clothing ends up in landfill or incinerator – read more about that here. In order to meet the demands of shopping and returning clothes bought online – retailers actually have to OVERPRODUCE to meet demands. That’s right, they have to make more clothes than they know will ever be retained and worn, so there is enough stock to go out and be returned by customers! Consider shopping on the high street instead of online. Not only will you reduce the environmental impact of returns and delivery vans on the roads, you’ll be more selective with your purchases and are likely to get more wear from them. Lets be honest, we’ve all got clothes hanging in our wardrobe we ordered online, meant to send back and just never quite got round to it – burnt orange palazzo pants currently residing in my wardrobe, I’m looking at you! 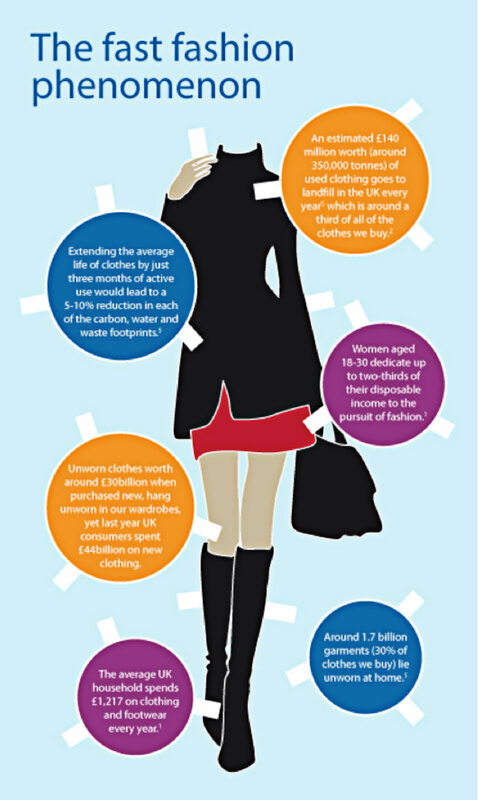 Did you know the average Britain only wears 70% of the clothes in their wardrobe? Worse than that, while the average item of clothes in someone’s wardrobe is in there for three years, the vast majority of the time worn is in the first year. After that it tends to find itself at the back of the wardrobe unworn. Frankly our wardrobes are full of clothes we don’t wear. I decide to have a look in the depths of my wardrobe and see if there is anything I don’t wear anymore that I could make use of. Straight away I’m able to ‘downgrade’ some evening pencil skirts to workwear and I find a fitted black top I had completely forgotten existed . Taking the time to make sure all your clothes are hanging up neatly, pressed and organised in a way that you can actually see what’s in there will make it much more inviting to wear. Extending the life span of clothes by only three months of active use would lead to a 5-10% reduction in each of the carbon, water and waste footprints. As the weather got colder, I found myself wanting a bit of a winter refresh of clothes. Trying to avoid simply popping to Primark as I might have in the past, I headed to my local St Oswald’s Hospice charity shop to see what I could find. I’ll be honest, my first impressions weren’t overwhelming. Who knew you could fit so many pensioners in one room! The first rack contained so many ‘blouses’. I was ready to call it a day early doors then like magic, a belted shirt dress caught my eye. I looked at the label and the fact it was only £3 was the least of my surprises – it was Oliver Bonas! I left the shop with the Oliver Bonas dress, a grey wool coat, a tailored M&S skirt and emerald green jumper that has quickly become a winter staple. If, like me you thought charity shops were just twin sets and cardigans, I’d really suggest giving it a go. Smart Works Newcastle are hosting a second hand clothes sale at Quorum’s Christmas Market, they provide high-quality interview clothing for vulnerable women in the North East at the crucial point that she has a confirmed job interview. Don’t forget to extend the life of your clothing by donating it to charity shops. Not only are you increasing the lifespan of your clothing by passing it onto someone else, you’re also helping raising money for charity too. You get what you pay for. Its an old adage that in terms of sustainability rings true. Spend more on an item and you’re likely to get more wear out of it. I understand that not everyone is going to suddenly be able to afford designer clothes, but there are still swaps that can be made. Spending a bit more on classic staple items you’re likely to wear again and again will be much more economical in the long run. In conclusion, I’ve found that the more I’ve looked into the impacts of fast fashion, the less I’ve found myself wanting to pick up a quick bargain for a night out – and while I cant say I’ll never shop in Primark again (can you guess where our outfits for the Christmas market come from?) I’ve definitely reduced the amount of items I consume and think about the impact items might have– and I hope after reading this, you might think about doing the same. Join us for a clothes swapping event at Quorum on Wednesday 27th February. We’ll be collecting donations throughout February. Read more on our website here. Check out the Smart Works Second Hand Clothes Sale at the Christmas Market on Wednesday 5th December in our Q12 Building.